Let me clarify something first – there are two popular quizzes circulating over the internet. And there are two different answers for them. I will deal with both here. Answer: preassumptions cause this situation to be physically impossible. The second – as shown in Mythbusters – is a little different: “An airplane cannot take off from a runway which is moving backward (like a treadmill) at a speed equal to its normal ground speed during takeoff“. I marked the difference. It is important. First, you need to consider the laws of physics that govern this situation. There are several forces applied (or not being applied) here. These forces are applied at specific points. To take off the airplane needs speed (airspeed, airflow). So it needs to accelerate. In this text I will discuss how it can accelerate on the conveyor belt (accelerate in relation to air and the outside world – not only in relation to the conveyor belt). What you need to remember from this part is that the thrust is a force coming from the acceleration of gas (air surrounding the plane). This is a very important part. “Object at rest stays at rest”. To move the object we need an “unbalanced force”. Before we move to the balance of forces there is an additional factor we need to consider. Frictional resistance to the relative motion of two solid objects is usually proportional to the force which presses the surfaces together as well as the roughness of the surfaces. Since it is the force perpendicular or “normal” to the surfaces which affects the frictional resistance, this force is typically called the “normal force” and designated by N.
Why do we need to think about inertia and friction in this experiment? In layman’s terms… Take two objects, one laying on top of another. For example – a tablecloth and a plate. Now pull the tablecloth… the plate will move. Or it will not. Or it will move but only part of the way the tablecloth moved. This is the famous tablecloth trick. The faster you pull the tablecloth – the smaller the movement of the plate is. Inertia and friction. Pull the tablecloth slowly and the friction will be sufficient to exert a force on the plate to overcome its inertia. Pull rapidly and the friction will be insufficient. If you do not know this trick – watch it on youtube. Modify the experiment. Instead of a plate use a round pencil. Or a ball, tube, or any other round object. You may even take a toy car. Put it on a piece of paper. And pull the sheet. You will notice that it is much easier to move the sheet without moving the pencil (or the ball). This is because the friction of a round object is much smaller. And it may require a lesser force to rotate them without moving. Congrats – you have just invented the wheel! This is why we use them in cars, trains, carts, etc. Congrats – you have just invented the wheel! This is why we use them in cars, trains, carts, etc. Ok. Let’s move to our problem – what will happen if we place a plane on a conveyor belt? For a moment, please do not think about any specified speed of the conveyor belt. Just think of this Jumbo Jet and the conveyor belt underneath. Engines stopped. Now let’s turn the conveyor belt in our imagination. What happens? If it moves very, very fast from the beginning – the plane will stand still. Just like your pencil or a toy car when you dragged the sheet of paper from underneath. Ok – let’s be wise and do this again properly – we will start the conveyor belt on a slow speed, then accelerate (slowly). What happens? The same what happened with your pencil if you moved the sheet very, very slowly. It moved without rotating. Once again – the friction of the wheel (pencil) is sufficient to overcome its inertia. 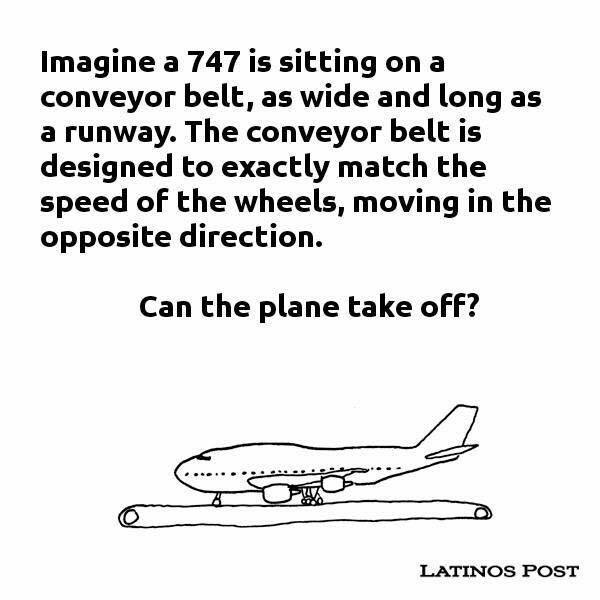 By this point, you should understand the physics of the relation between the plane and the conveyor belt. Now we will start the engine and check what happens. The engines are running and producing thrust. So the plane “wants” to move forward – accordingly to the direction of thrust. Will it? Not necessarily. Do you remember about inertia? And friction? We have an object at rest and it will move only when there is an unbalanced force. So the thrust alone is not enough to move the plane in every case. You need a sufficient thrust to overcome the friction. It is like when you move an object. Push gently on a heavy cupboard and it will stand still. Push it really hard and it will move. The same happens here. Fortunately – the plane stands on wheels and it is much easier to move it. This is why a plane requires more power to start moving. And why it uses all of its power (thrust) to takeoff. Now we will apply all the forces together. Engines are running at full power and the conveyor belt is running. What happens? There is a collision of forces! On one end we have the thrust that is pulling the plane forward. It is sufficient to overcome the friction of wheels. On the opposite end, we have the conveyor belt that is trying to move the airplane backward. Now – let’s discuss the forces! Thrust is powerful enough to overcome the friction of wheels and accelerate the plane. The conveyor belt is moving the plane in opposite direction. But does it? Moments ago we have discovered that to move an object the friction between the object and the conveyor belt needs to be huge enough to overcome its inertia. At this stage, it is not only the inertia but the thrust that needs to be overcome. And the friction force was very small – the plane has wheels. And as it is accelerating – the conveyor belt would have to accelerate. But we have already noticed that a rapid application is not good either (tablecloth trick). In fact – the more powerful the engines are – the more similar this experiment is to the tablecloth trick. But instead of high-friction plates we have low-friction wheels. So let’s sum up the forces. We have huge thrust. Against it we have the friction of wheels that is normal on takeoff. We also have the additional friction caused by the conveyor belt. 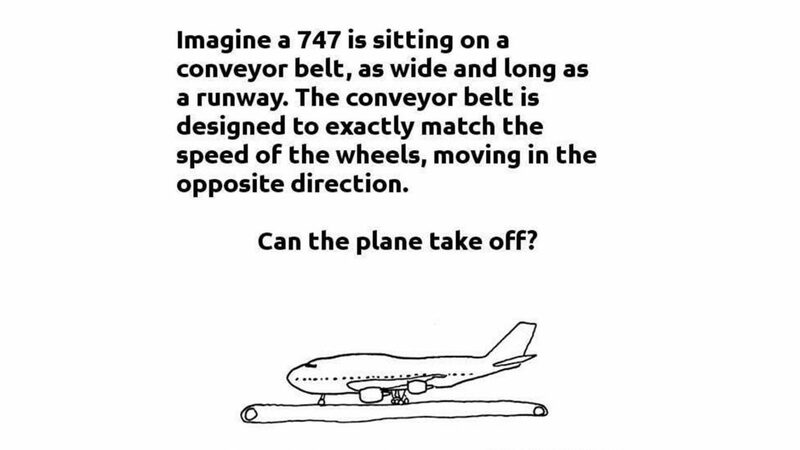 Will the plane fly? Yes – it will. Sure – the take-off will be longer as the acceleration will be a little slower/longer due to the small force applied in opposite direction, but planes have more power than needed to accelerate it to the take off speed. Their engines are capable of overcoming forces much greater than the friction on takeoff. Keep in mind that there are flying boats which are capable of overcoming the huge friction of their fuselage accelerating in water when they take-off! a This is the power of engines and a relatively small force exerted by the conveyor belt through wheels is just too small to overcome them! So back to the quizzes that cause heated discussions across the internet! This is the problem! The wording of this quiz is wrong and makes it physically impossible. Divide this situation to several steps. At first, everything is just the same as in my explanation above. We apply thrust and we run the conveyor belt in the opposite direction. The wheel starts turning. As the plane moves forward – the conveyor belt accelerates. Keep in mind the preassumption “conveyor belt is designed to exactly match the speed of the wheels”. When the aircraft moves forward then its wheels have to travel further than the conveyor belt has moved back. But this is impossible in this situation. The conveyor belt is designed to match the speed of the wheel – so it will increase the speed. But the plane still moves forward – there is again a difference between the speed of the wheel and the speed of the conveyor belt. But we do not allow such situation! So we increase the speed of the conveyor belt! It lasts until wheels and conveyor belt speed reaches infinity. Or until they reach the speed of light. If you wish to know what happens then – consult the screenwriters of Start Treck or Star Wars. The object will not stay motionless because we have unbalanced forces. So we can not design the conveyor belt to move at the same speed as wheels. This should be already easy to understand. The plane will fly. With such a specific data we can even say with certainty that on take off the wheels will be turning at twice the normal speed. So if the takeoff speed for a passenger plane is 130 knots, the wheels of this plane will rotate like the plane was moving 260 knots. The increased friction of the wheels turning at twice the usual speed will increase the takeoff distance, but apart from that – nothing will be significantly different. A plane is not a car! The car accelerates when the wheels rotate on the ground. It uses friction to its advantage, but if you place it on the conveyor belt – it will need to turn its wheels much faster than normally to move forward. To be exact – you will need to turn the wheels with the speed you move (in relation to the outside world) + the speed of the conveyor belt. This is not the case in these squeezes since the plane does not rotate its wheels. Wheels of the plane rotate freely. Do not forget about the tablecloth trick! Some people just assume that the conveyor belt will move the plane back. The job of the conveyor belt is in both cases mostly limited to rotating the wheels. You do not need a plane and a conveyor belt. Just get a medium size tube. Or a bottle. And place it on a smooth surface (a large sheet of packing paper is easily available). And then pull the surface towards you and blow on the tube. It will roll forward. Your blowing is the thrust. The sheet of paper acts as a conveyor belt. If you are interested in physics – repeat the same test with various materials. Try a heavy rubber tube on a rubber belt. You will see that you need much more thrust (you need to blow much harder) because of increased friction. Just keep in mind that the friction of aircraft wheels is very small. And the power (thrust) of its engine is huge!